I’ve been driving manual transmission cars since I was 16, but I had only heard the terms “downshift” and “downshifting” related to gears. A couple years ago, I was delighted to discover the same terms can apply to our lifestyles. Change a financially rewarding but stressful career or lifestyle for a less pressured and less highly paid but more fulfilling one. 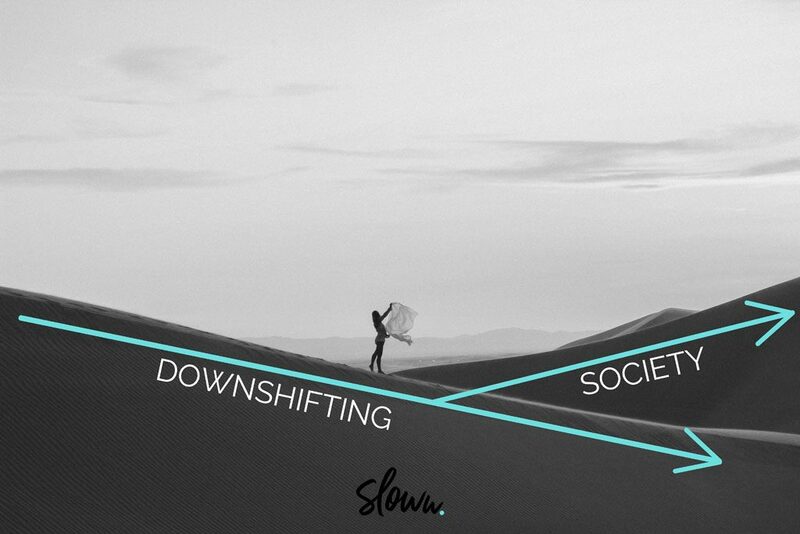 Since I just quit my corporate 9-to-5 job last week, now is the perfect time to revisit downshifting. The definition above is very fitting; the only difference is “less highly paid” means “nada” for me right now. If you’re interested in simple living but don’t know where to begin, downshifting is a great place to start. If any of your friends or family express interest in slow or simple living, this is a great post to share with them to get them started on their journey. What is Downshifting and who are Downshifters? Downshifting and technology: Also, keep in mind, those articles were written before Facebook and before the iPhone — a time that seems like a lifetime ago. It seems like society has only exponentially increased its speed since then. In 2018, we are now desperately in need of downshifting to have a more intentional pace in our lives. While downshifting can mean taking a step back to reevaluate your life, it doesn’t necessarily mean going back to a time before technology. I personally believe we should use technology as a tool to make our lives better — instead of technology using us. But, new inventions and innovations can also unintentionally create new problems and challenges. Technology addiction is a real thing today; digital minimalism and digital declutter are growing trends. Downshifting is a choice: Downshifting — like voluntary simplicity — is all about choice. Downshifting isn’t one-size-fits-all: Everyone has a different motivation (or motivations) to downshift and start their simple living journey. There are people who want to quit the corporate rat race (escape the “work-and-spend cycle”), and there are people who simply want to work less or find a similar but less stressful job. Others do it to spend more time with family, children, and friends. And, for those sustainably-minded, some do it to lower their ecological footprint. Consumption Downshifting: I started downshifting my consumption in late 2015. I’ve made huge strides in things like eating out and clothing. But, the big purchases like house and cars are still things my wife and I are working on (currently guilty of lifestyle inflation) — hopefully we’ll have some big (good) news to share on those in the coming months. Lifestyle Downshifting: I’ve been attempting to adopt a slow living lifestyle outside of work since late 2015 as well. Unfortunately, there was only so much I could do outside of my 60/70/80-hour workweeks. Career Downshifting: Quitting my 9-to-5 job last week has finally allowed for this one to be combined with lifestyle downshifting. For the indefinite future, I own 100% of my time — aiming to work-to-live instead of live-to-work. Downshifting doesn’t happen overnight: That’s why it’s called downshifting! It’s a gradual process. This is an important one. So important, that I felt compelled to illustrate the point based on my own personal experience. The image below shows the belief I (like many others I’m sure) thought life was going to be like after I decided that I was going to adopt slow and simple living. I thought the tipping point was going to be like flipping a switch. One day life is crazy busy and complicated, the next it’s slow and simple. That’s how it works, right? 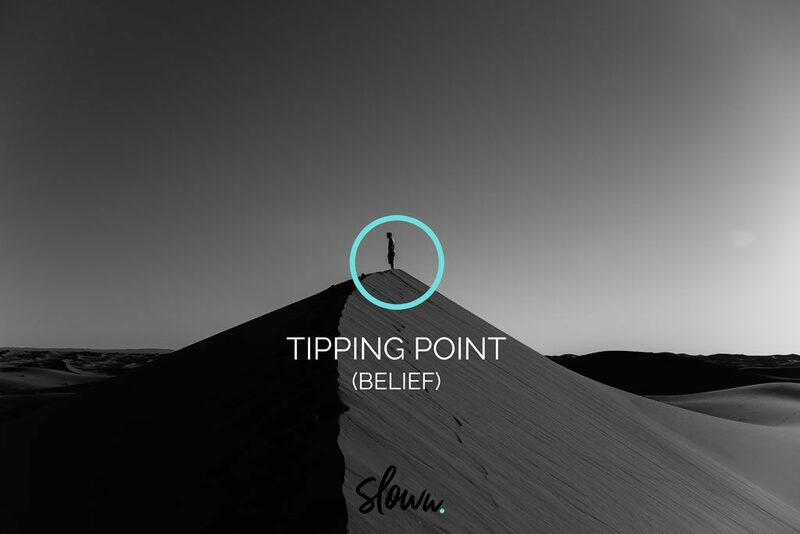 Instead, the tipping point isn’t technically a point as much as a plateau. It takes a lot of conscious and intentional effort to make big consumption, lifestyle, or career changes. If you’ve been speeding up and consuming more your entire life, it’s not going to simply change overnight to slowing down and consuming less. So, the image below represents my reality now looking back on it. 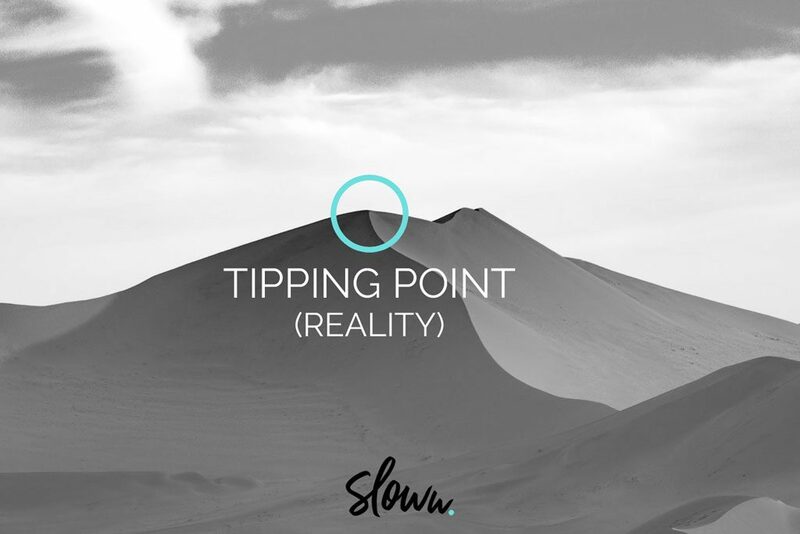 The tipping point shows where a decision to live a life of slower and less was made. However, it’s not always easy. After the tipping point, you’ll notice that things start to gradually decrease but then revert back to increasing. Relapsing into old behavior isn’t uncommon. After all, the best predictor of future behavior is past behavior. But, I finally feel like I’ve just crossed over the second peak in that image and am now on a true path of deceleration into slower and simpler living. First, bookmark and routinely revisit the downshifting definitions, descriptions, myths, and realities above. Remember that this is a choice: Choose your own adventure. Think about what motivates you and what type or types of downshifting you think are right for your life right now. Define your purpose: Take inspiration from Gandhi or the people in the Blue Zones who live simply beyond the age of 100. Maybe try the method of asking yourself “Why?” five times. Track and analyze your finances: Think about how and where you can and will fund your consumption, lifestyle, or career changes. I recommend checking out the FIRE community (Financial Independence Retire Early). Think about money as freedom instead of something that’s spent on things or experiences. Join the conversation: There are some great slow and simple living forums and communities online. And remember, it’s a journey: In some cases, it will take a lifetime. The initial image of this post is the same as the last one below. Society will always try to lure you back — I describe this as the “elasticity of society.” It’s very easy to snap back into society and get back on the on-ramp to mainstream society. Stay strong! Good luck! I’m with you on this journey to less stressful, more fulfilling, lighter living. Have you tried downshifting? I would love to hear your story in the comments.